Tony is a self-taught tattoo artist who was born in Mexico; he migrated to the United States with his parents at the age of 2. As a kid, Tony enjoyed drawing. During his teenage years, Tony was also into Graffiti Art. At the age of 18, Tony was involved in an unfortunate situation that led to him being incarcerated for a few years and on the verge of losing his liberty. While in prison, he had rediscovered his passion for drawing. He enjoyed reading about artists and was inspired by tattoo magazines. Tony had enough time to recollect his thoughts and find his purpose in life. 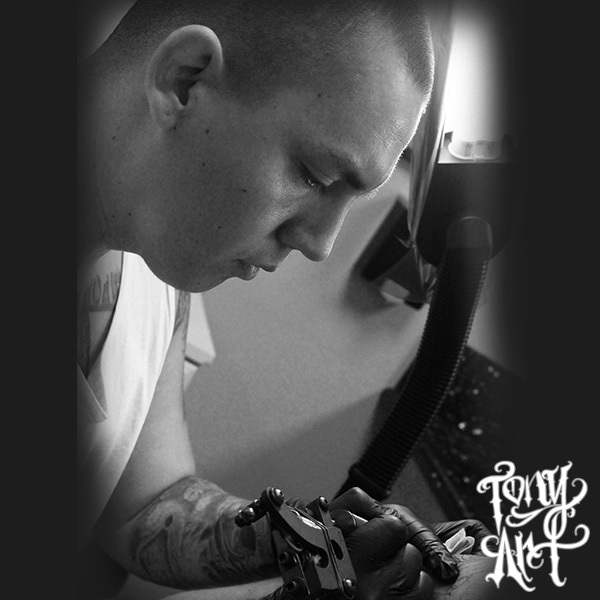 He knew that tattooing was not just a hobby, he wanted to make it a career. Tony was released from prison in 2009. Due to his criminal background, Tony faced many challenges in the real world. He knew that he had to work twice as hard to get his life going. He began tattooing in 2010 but did not get ino a professional shop until 2013. He specializes in Black and Grey style, portraits, realistic, skulls, etc. He also enjoys working together with the client to create an original piece. When Tony is not tattooing, he loves spending time with his fiance and his two children. He also enjoys studying his craft and various art mediums such as: Charcoal, Graphite, Arcylic and a few others. He believes that knowledge with action is power and one must continue to learn in order to succeed as an artist.